If you’ve been following this blog you must have noticed my appreciation for a neighbouring country, Uruguay (I live in southern Brazil and only around 200 km from the Uruguayan border). 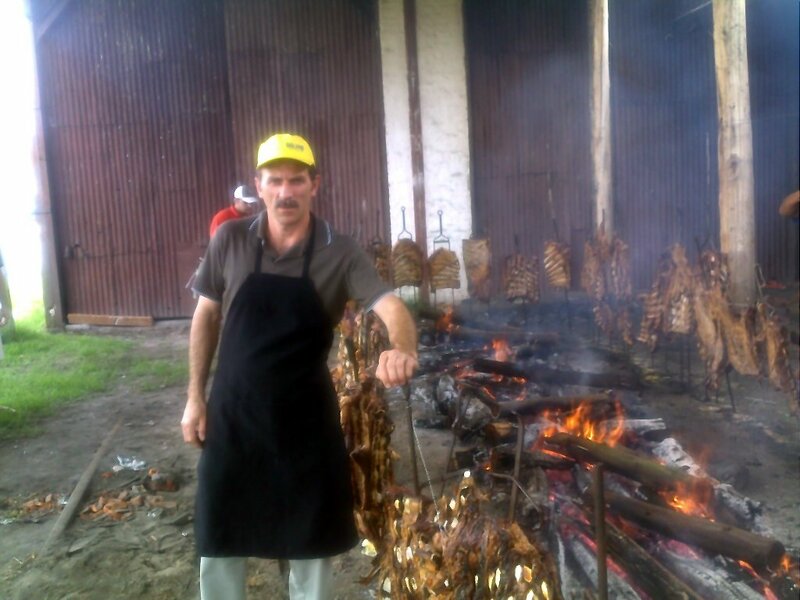 I’ve written about “parrilladas“, the national Uruguayan dish, as well as about my fishing experience in the Salto Grande dam. Let’s return to this lovely town. Salto (official site here – sorry, only in Spanish), was stablished in 1756 by the governor José Joaquim de Viana, who was on a mission related to the settlement of frontiers between Spanish and Portuguese colonies. Salto faced a great population increase after 1860, with the arrival of European settlers, specially from Italy, Spain and Portugal. Around Salto, one of the largest touristic destination in Uruguay, you can find several hot spring areas, particularly “Termas de Dayman” (around 15 km south of Salto) and “Termas de Arapey” (around 90 km north of Salto). Today, with around 100,000 inhabitants, Salto maintains a charming and relaxing atmosphere. Walking around downtown with my wife and some friends (Renan and Leila), on a beautiful summer day, my attention was called by a small restaurant called “La Trattoria” (Calle Uruguay, 754 – GPS: S31 23.245 W57 57.969), a clear reminder of the Italians who arrived after 1860. We walked in and let me tell you, no regrets. The food was very well prepared and the house wine just up to the Uruguayan tradition. One distinctive feature of Uruguayan wine production is the Tannat, a red grape generally ignored in the rest of the New World but very important in this small and wonderful country. It matched just fine the meat lasagna (a la Bolognesa), plenty of muzzarela and a rich tomato sauce. Final price? Around US$12,00/person, wine included. The whole experience in Salto was a definitive proof that Uruguay has much more to offer than just “parrilladas” (although they continue to be my favorite Uruguayan creation). The most southern Brazilian state is Rio Grande do Sul, the larger part of which, as well as parts of Uruguay and Argentina, is covered by the pampas. From these flat lands, with a vegetation which favours cattle raising, comes some of the best meat in the world. 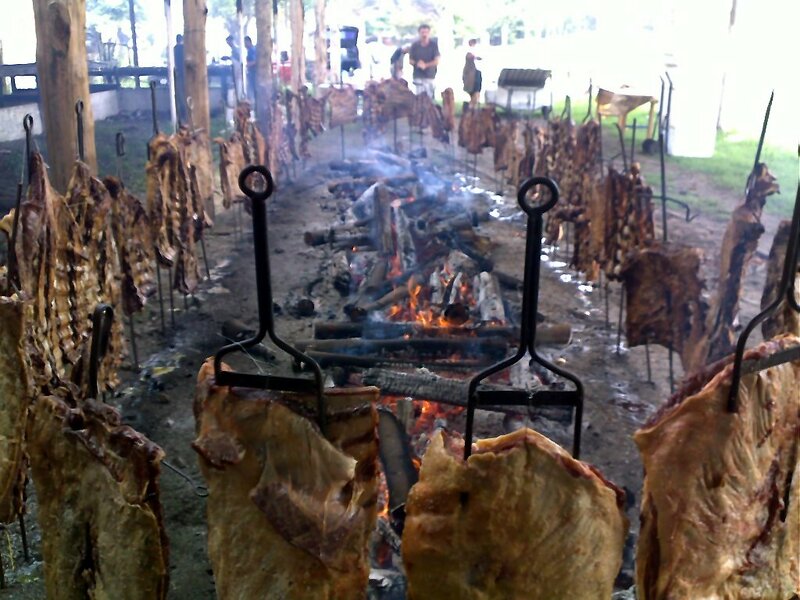 Using this wonderful meat, the “gauchos”, designation of the South American cowboys as well as residents of the Rio Grande do Sul state, developed a particular way to prepare BBQ, here called “churrasco”: plenty of meat, coarse sea salt as condiment and wood or charcoal fire. 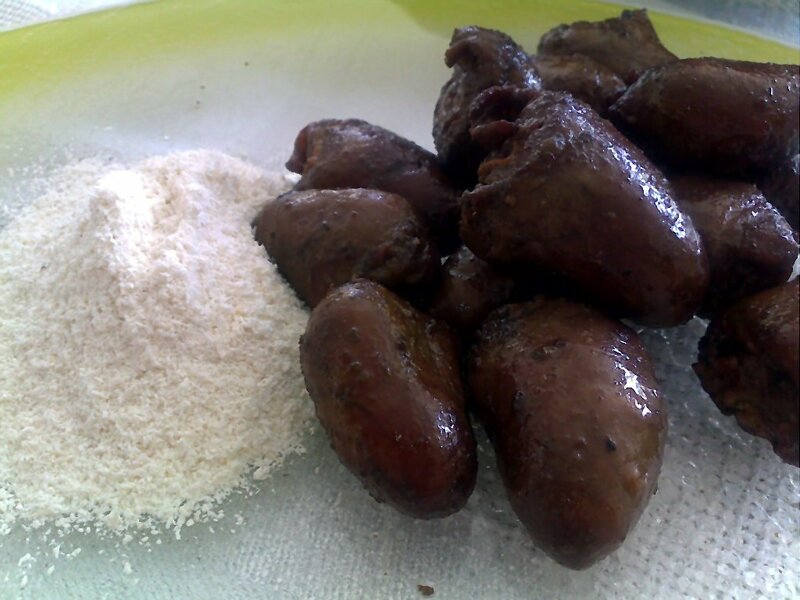 If you season the meat with anything different from salt, or if you don’t use wood or charcoal, you can’t call that a “churrasco”. And this is not a matter of opinion, it’s the law. And when I say the law, I mean it. This whole thing is so important in Rio Grande do Sul that it has found its place in the state legislation (State Law RS no. 11,929/2003). 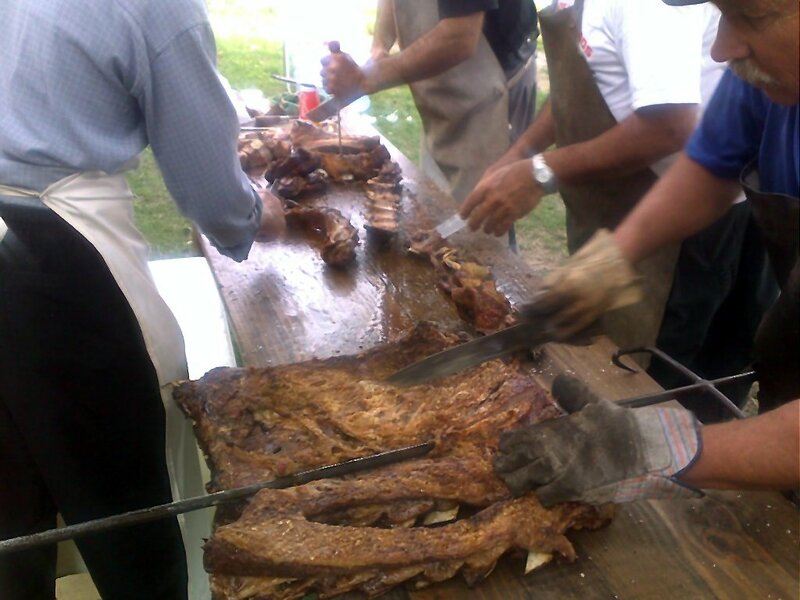 The Brazilian “churrasco” is equivalent to the “parrillada” in Uruguay and Argentina, also prepared by “gauchos”. One of the most common beef cuts employed are ribs, which are slowly grilled, at times for more than 6 hours, resulting in a very, very tender meat that almost detaches itself from the bone. 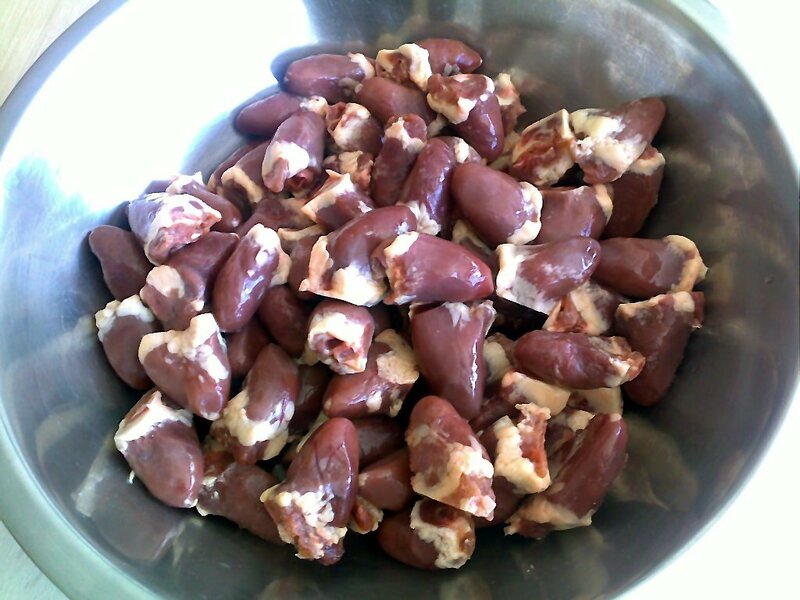 Nevertheless, due to high fat content, the meat remains juicy and tasty. You can see here a young fellow preparing “picanha” (rump steak, I believe), another common cut (notice the fat and the amount of salt used). Well, ribs are what I had for dinner last night over Renan’s house, a very nice friend who remembered me when he decided to prepare some “churrasco”. Hope Renan keeps remembering me for quite a long time. 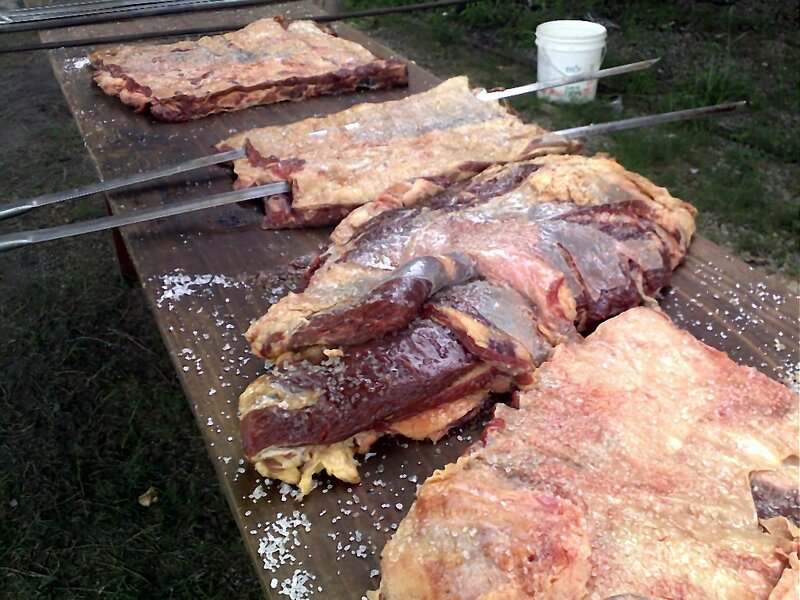 I’ve already posted a few lines on this wonderful Uruguayan invention, the “parrilla” (See “Parrillada in Uruguay“), a traditional system for preparing the not less marvelous Uruguayan beef. But, there is much more. One of the activities I enjoy is fishing, what I usually do at Cassino Beach (GPS 32”.162283 Lat. S, 52.110901 Long. W), the largest beach in the world, extending for over 200 km, from the Patos Lagoon estuary to the Chuy River, at the Brazilian border with Uruguay. This time I decided to try my luck with freshwater fishes, and thus headed to the city of Salto (GPS 31.389126 Lat. S, 57.958374 Long. W), right beside the Uruguay River, which separates Uruguay and Argentina. The reason is the existence of the “Salto Grande” dam, an hydroelectric plant shared by these 2 countries, as it has created an excellent environment for fishing “dourados” (in Portuguese) or “dorados” (in Spanish). “Dourado”, wich means “golden”, is also known as the “tiger of the river” or “tiger-fish” due to its voracious appetite. Its scientific name is Salminus brasiliensis (but also known as Salminus maxillosus or Salminus affinis), which means “little salmon from Brazil”. In fact, it belongs to a quite different fish group, being much more related to the piranhas than to salmons and trouts, although they play a similar biological role in the environment (same niche). It’s very appreciated in sport fishing due to its bravery and resistance, as well as its size (it may reach up to 20 kg). Enough of information, lets fish. Well, after spending a whole morning on a small boat on the Uruguay River, just beside the Salto Grande dam, one 4 kg fellow decided to bite my hooks. Wonderful catch. What to do with it? 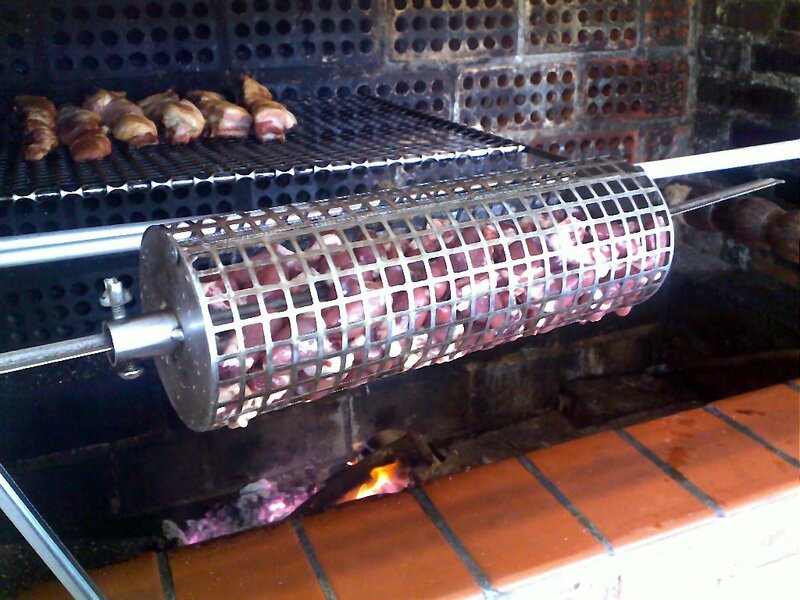 As we were in Uruguay, grill in a “parrilla”, of course. And so it was. We (our friends Renan and Leila, my wife and I) brushed the fish with some olive oil and seasoned with salt and pepper only, lighted a good wooden fire in a “parrilla”, and put the fish to grill over the charcoal for a few of minutes. Impossible to have a fresher dinner. Grilling the golden tiger in a "parrilla"
The taste was mild and clean, and was matched with a demi-sec Spanish cava. Although we were fishing in fresh water the price was rather salty, as the fish alone costed US$ 160,00 (the cost for renting the boat and the fishing gear for me and my friend). There was also the cava, salad, wood…..well, you can add this up, if you care to know the total amount spent. But I bet you won’t get it right, as I can’t even imagine the price of the adventure, the taste and specially of the good memories.